South Georgia is arguably the most stunning place I’ve ever visited for wildlife and photography. Warning: This is a photo-heavy post but it’s worth the bandwidth! 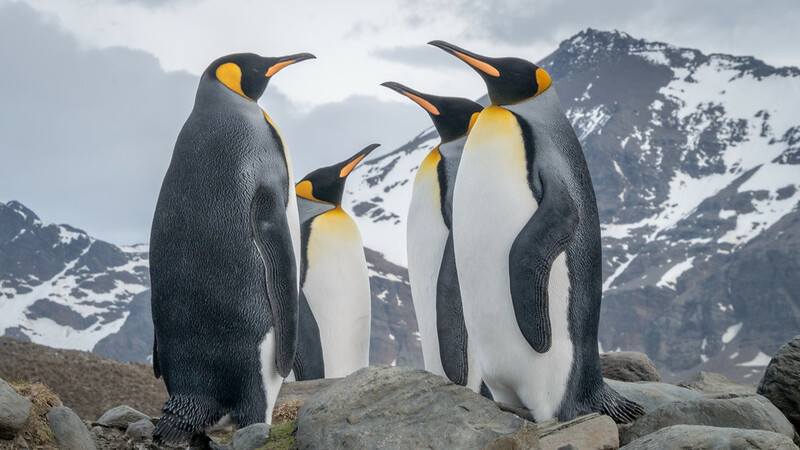 The island of South Georgia is only 165 kilometers long and <35km wide, but it contains incredible mountain landscapes, with peaks up to 2,934M, and shocking quantities of wildlife, including millions of penguins! 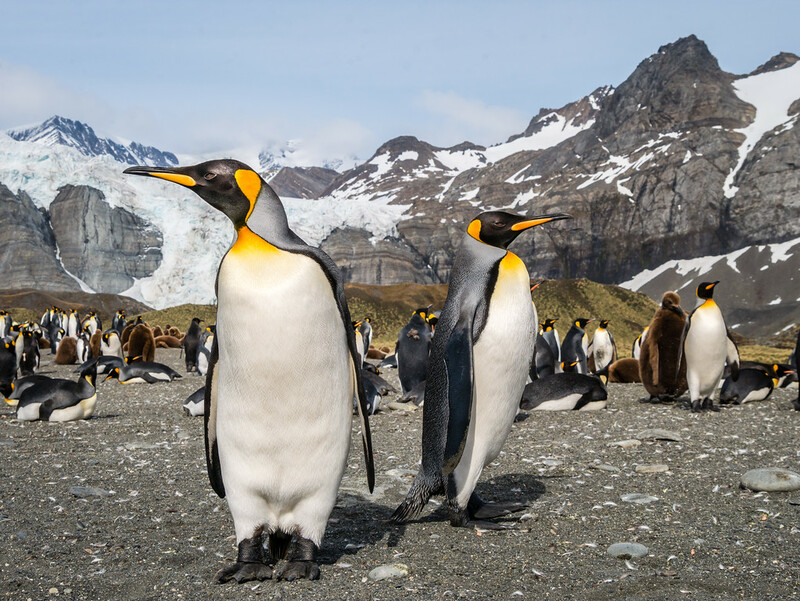 Incredibly, I hadn’t heard of South Georgia and the South Shetland Islands until beginning my search for Antarctic cruise options; rather astonishing for a geography nerd like myself! South Georgia is a British Overseas Territory located 1,300km south-east of the Falkland Islands. Captain James Cook circumnavigated the island in 1775, claimed the territory for Great Britain, and named it after King George III. Although Argentina made claim to South Georgia and the Falkland Islands, the United Kingdom won the Falklands War and the island remains under UK control to this day. South Georgia does not have an airstrip and is therefore only visited by way of ship. You’ll need to save your pesos because these journeys do not come cheap. I considered it a once in a lifetime experience when I laid down the cash, but it was all so incredible that I’m trying to determine which organs I can sell to do it over again. Totally worth it! 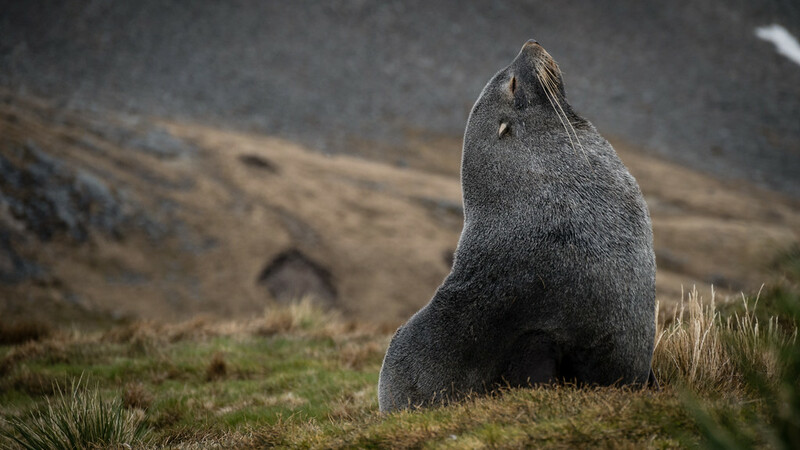 Our Russian vessel, Akademik Sergey Vavilov, departed Sea Lion Island in the Falkland Islands and set course across the Scotia Sea, giving us several days to adjust to life on board. While nearly 3 days at sea may sound boring, I thoroughly enjoyed my time aboard the ship. 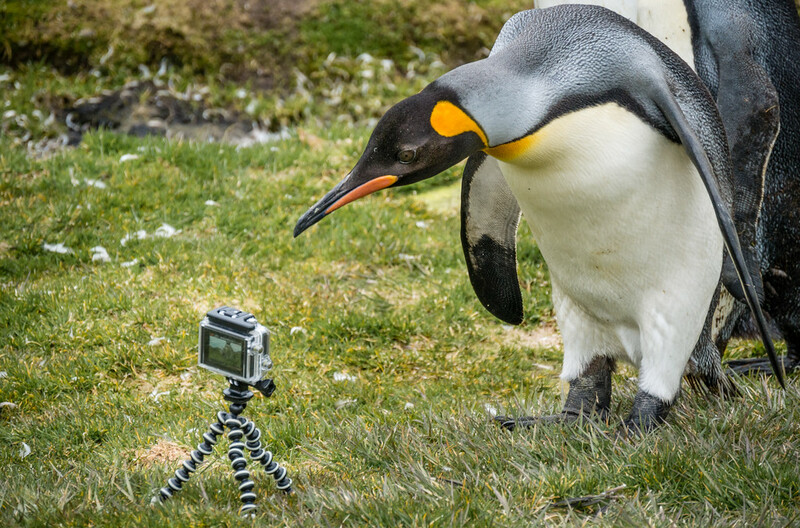 The staff gave very interesting presentations on Tourism in Antarctica, Sea Birds of the Southern Ocean, Glaciers and Glacial Landform, Photography Basics, Antarctic Fur Seals, and William Shackleton. We were also equipped with our expedition gear (heavy jacket, trousers, boots, and dry bags) and conducted a thorough “bio-security scrub” to ensure no foreign seeds were transported on to South Georgia once we arrived. While other travelers were struggling with sea-sickness, I spent late nights in the observation deck / bar watching for wildlife and getting to know other travelers, many of whom are now friends for life. I spent most of my free time at the observation deck / bar, watching for whales and dolphins, and enjoying the Happiest Hour of the Day with our bartender, Sweet Uncle Dave. During the crossing, we saw loads of wildlife. 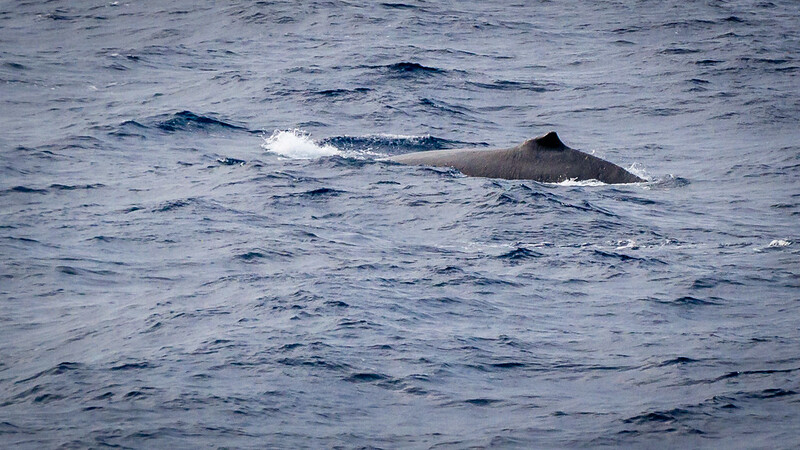 In addition to hundreds of seabirds who followed the ship along, we saw numerous mammals including fin whales, humpback whales, blue whales, killer whales, hourglass dolphins, and Peale’s dolphins. One great thing about the Southern Ocean is you never know when or what you’re going to see, so it was perfectly justified to hang out in the bar area where the whale spotting was best. 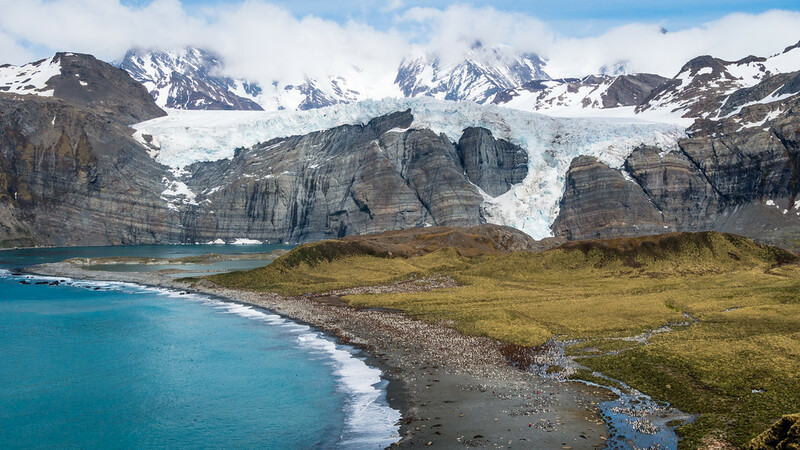 Historically, South Georgia Island served as a base for seal hunting and whaling. 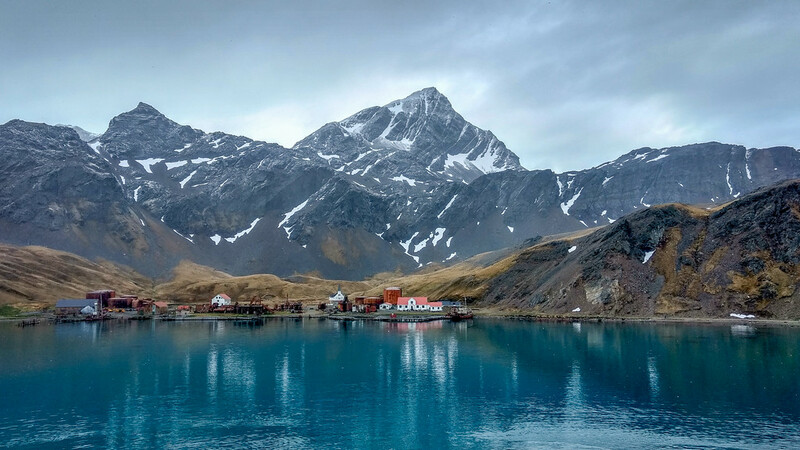 Grytviken means “pot bay” in Swedish, and was given the name after a Swedish expedition found old English try pots used for rendering seal oil at the site. 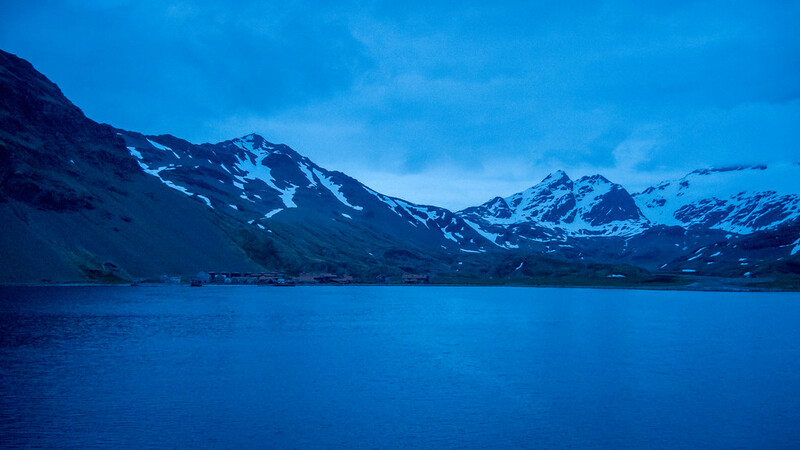 Grytviken is an idyllic place for a settlement and offers flat land, shelter, and plenty of fresh water. 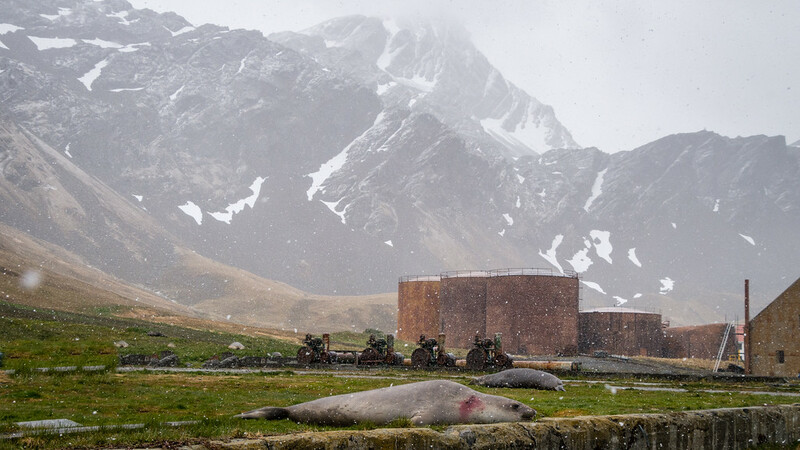 The settlement operated as a whaling station from 1904 to 1966, with up to 300 men working at the station during the southern summer. 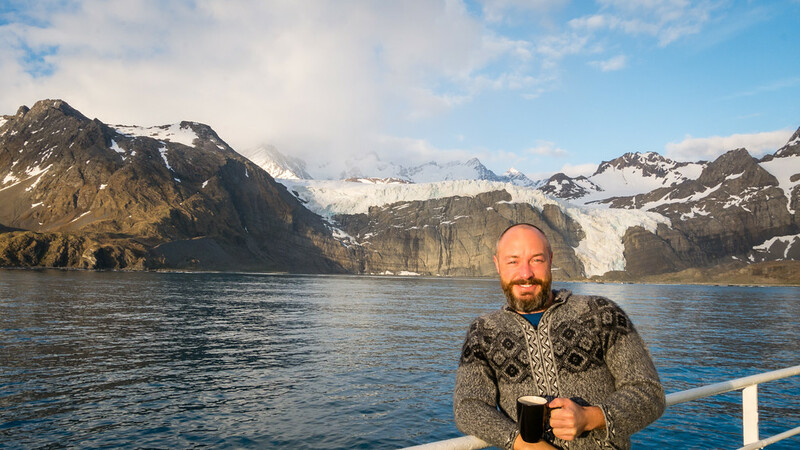 The year-round climate actually appears quite mild for a latitude of 54°S, at least from this Canadian’s perspective. During our visit, big fluffy snowflakes started falling to the ground, adding to the majestic ambiance of our surroundings. Unfortunately, the presence of whalers in South Georgia caused a lot of environmental destruction. 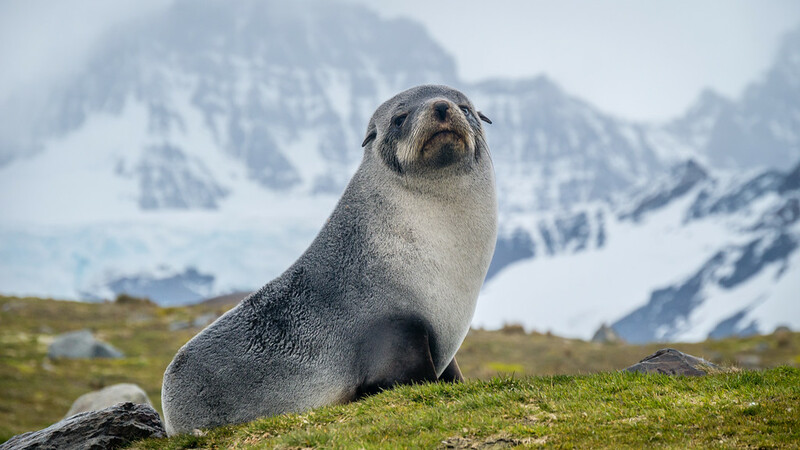 Along with drastically reducing the population of whales and elephant seals through their hunting, they introduced reindeer (intentionally, for meat) and rats and mice (unintentionally, as stowaways), which destroyed the South Georgia’s vegetation and bird nesting sites. Prior to landing on South Georgia, we were given a presentation about the South Georgia Heritage Trust’s efforts to eradicate invasive species, including the reindeer and rats. Between 2013-15, over 6000 reindeer were culled and ~300 tonnes of rodent bait was dropped by helicopters all over the island to kill the rats and mice. The efforts appear to have been successful and bird populations, including prions, pintails, and pipits, are quickly increasing in number. 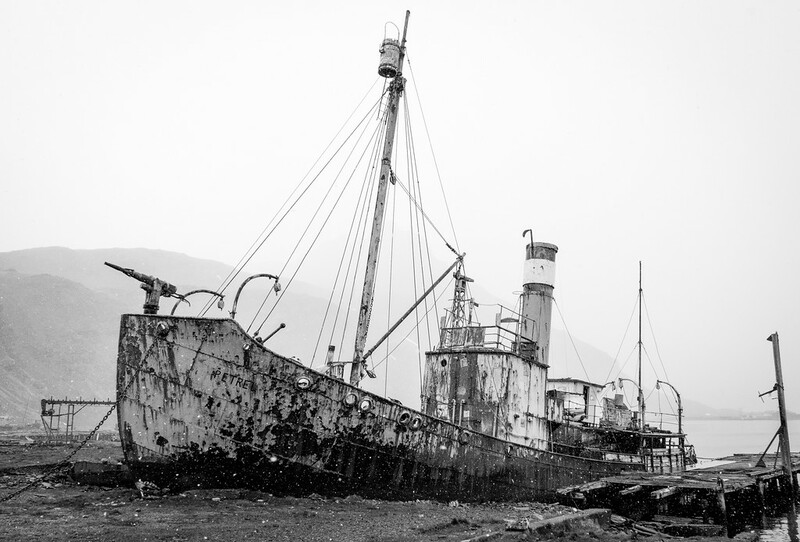 Grytviken is also closely associated with the famous explorer Sir Ernest Shackleton – AKA “The Boss” and “Bring ’em Back Shack”. Shackleton and his crew set out on a Trans-Antarctic Expedition in 1914, on their ship, Endurance. Tragically, the pack ice trapped and crushed their ship and the 28 crew members had to flee the ship. 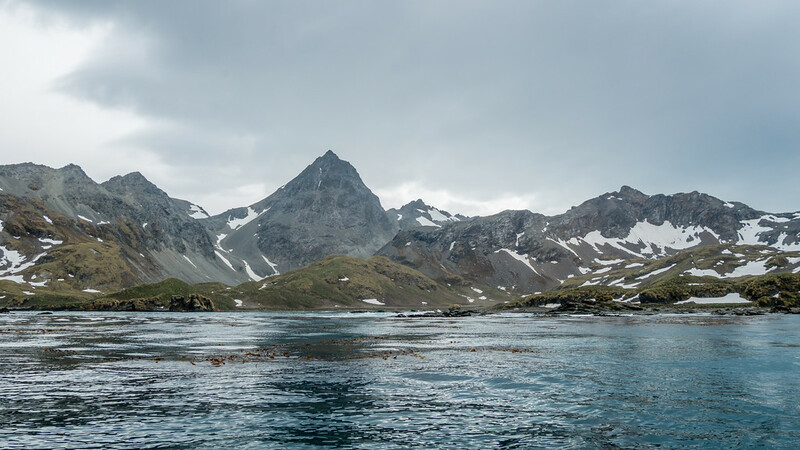 While most of the crew waited at Elephant Island, off the Antarctica Peninsula, Shackleton and five men made their way to the southern coast of South Georgia in a small <7 meter boat called the James Caird. 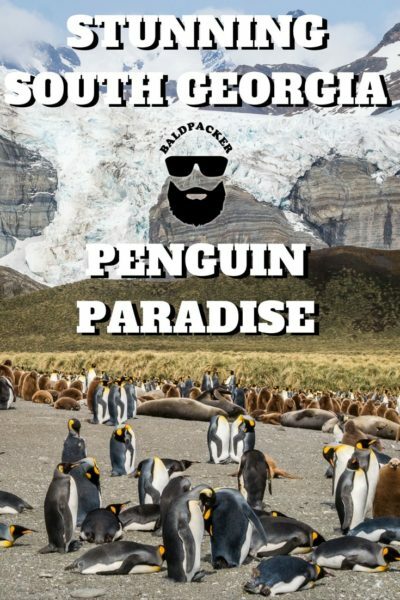 Eventually, they made it to Grytviken and Shackleton was able to organize a rescue operation for the men on Elephant Island, inspiring the name “Bring ’em Back Shack”. The story is exceptional, and even more impressive after seeing how nasty conditions can be in South Georgia and the South Scotia sea! 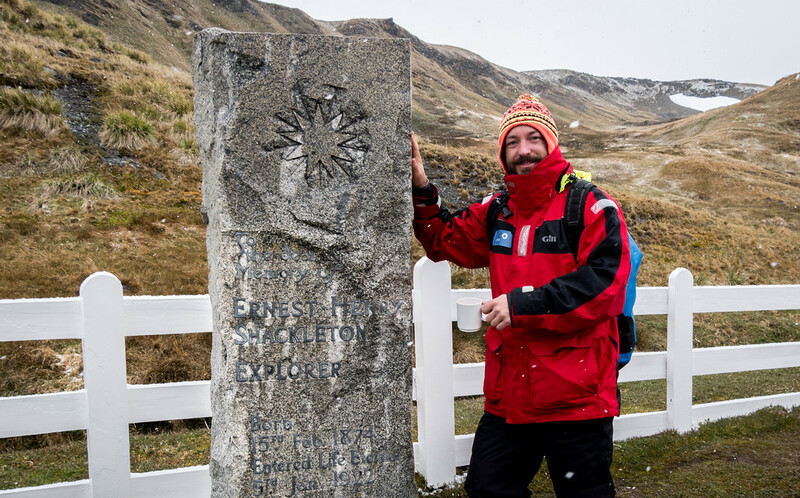 The graves of Shackleton, and his right-hand man, Frank Wild, are located in a cemetery next to Grytviken. Upon landing on South Georgia in the morning, our first order of business was to toast the lives and adventures of these exceptional men, and their crew, with a dram of Johnnie Walker Black. I think Winston Churchill was on to something by kickstarting his day with a whiskey and soda “mouthwash” as the JW Black took an edge off my morning chill! 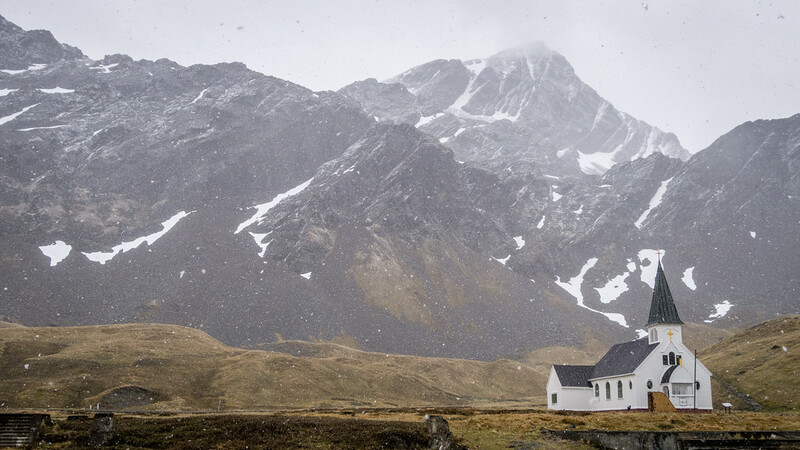 While the snow started falling faster and heavier, we had a chance to explore the settlement of Grytviken. There are a few buildings of interest remaining in Grytviken, including the South Georgia Museum (in the former whaling station manager’s house) and a Norwegian church, where I couldn’t help but vigorously ring the bell. Grytviken is the only place in South Georgia where you can get souvenirs, other than your own photographs. There is a small gift shop offering typical clothes, posters, and books and it is also possible to buy and send postcards. The ship’s staff also took everyone’s passports to be stamped with what must be one of the most expensive passport stamps in the world to collect. 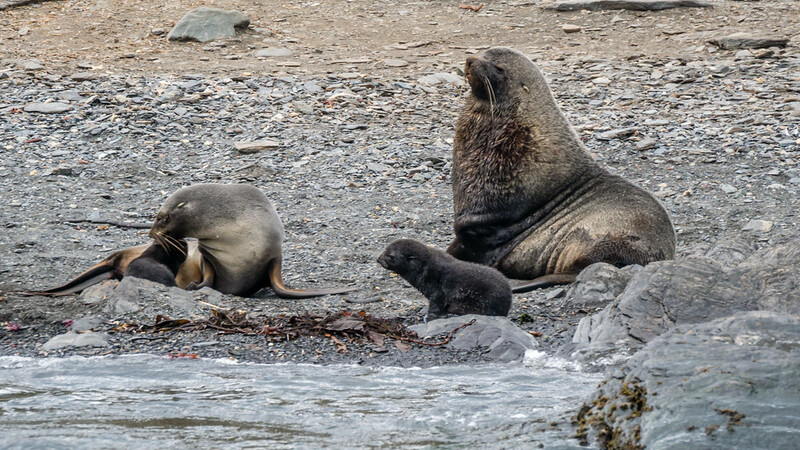 The afternoon expedition took us to Jason Harbour, where we were able to stretch our legs on a hike above the bay and observe more wildlife, including elephant seals, fur seals, and molting king penguins. We arrived at Stromness in the evening dusk, later than planned, making it difficult to see much of the former whaling station from the ship. Stromness is now primarily known for its role in the rescue and survival of Ernest Shackleton and his crew. I had inadequately researched the story of Shackleton and the Endurance prior to the trip but thankfully Jay, a fellow voyager, explained the significance of Stromness to me from the upper ship deck. Basically, when Shackleton and his small crew landed on the unpopulated southern coast of South Georgia, they still had to hike 42 kilometers across the interior of the island to Stromness, without a map, under the light of the moon. Given how mountainous, glaciated, and crevasse-filled South Georgia is, Shackleton’s success is unbelievable. No wonder people call him The Boss. Mountaineers have replicated the trek in modern times, with mountaineering equipment, maps, supplies, and training, and still struggled to make the perilous crossing. It’s hard to imagine how Shackleton and his men managed to find their way and survive in 1916, with limited supplies, after 17 days in a lifeboat on some of the world’s stormiest seas. Day 6 began with a yawn-inducing 04:45 wake-up call, but seeing Gold Harbour in the morning light, with a coffee in-hand, was the morning eye-opener I needed! I assume Gold Harbour received its name from the beautiful golden light that bathes the bay in the early morning. The scenery was such an unbelievably good surprise to me that morning, that it remains one of my most memorable moments of the trip. 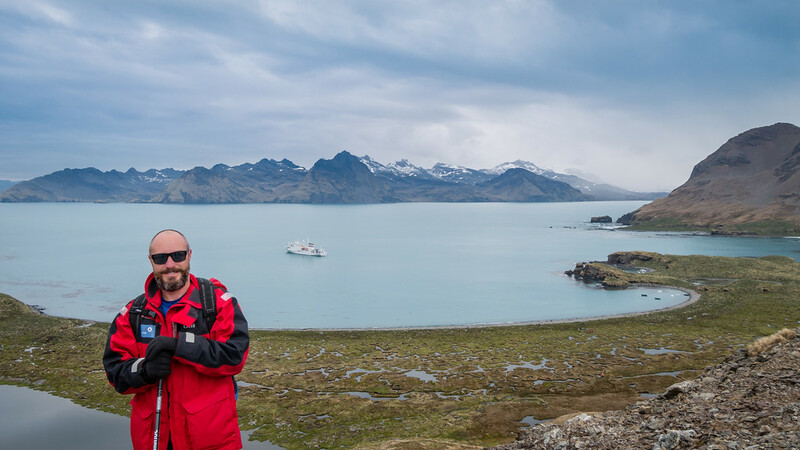 Gold Harbour was certainly one of the most memorable excursions of my entire Antarctic Cruise. The quantity of wildlife and glaciated mountain backdrops were too unreal for me to describe much further. These photos only give a glimpse into how incredible it was to experience firsthand. 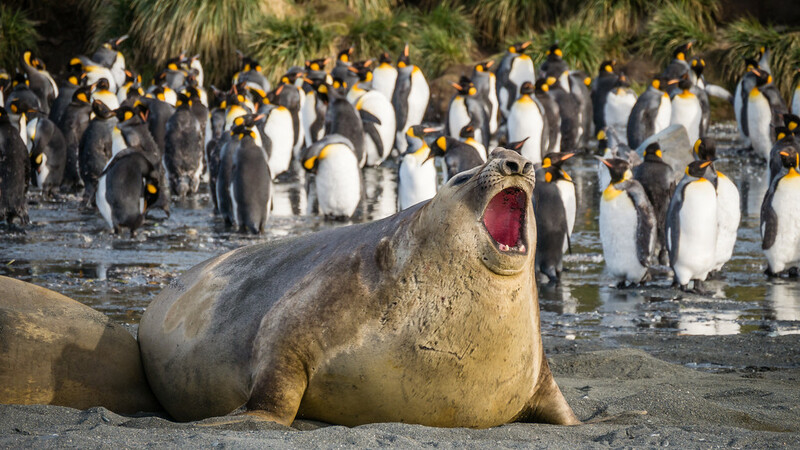 Imagine walking through a minefield of wildlife, trying not to encroach or disrupt anything, while hearing a constant squawk of penguins, accentuated by loud burps and farts erupting from the elephant seals. Paradise! 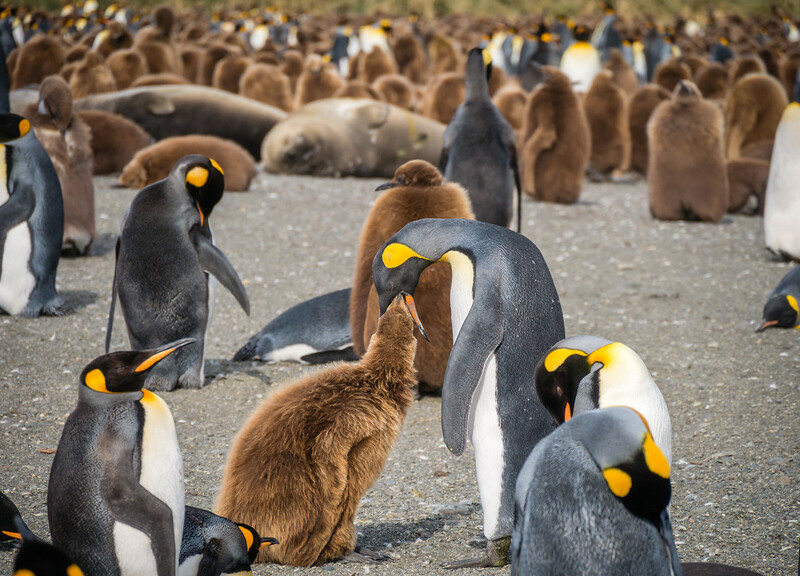 There were so many penguins and seals along the beach that it was virtually impossible to maintain the recommended distance from the penguins and seals. To avoid disturbing them, many of us hiked up above Gold Harbour to absorb the landscape in full. 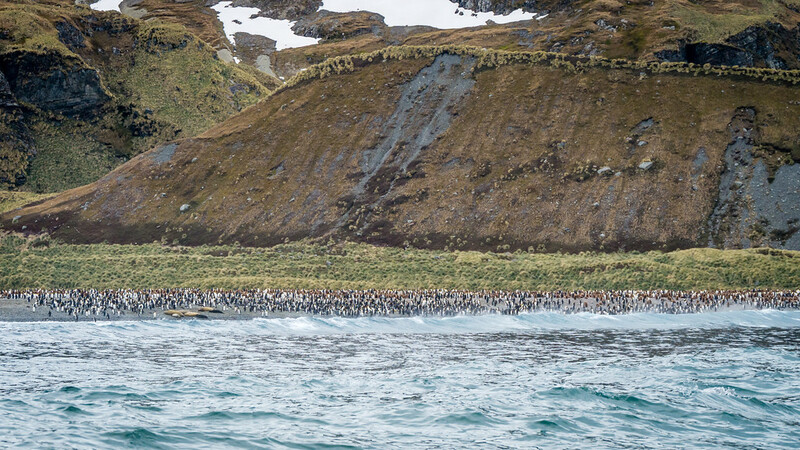 The resulting views showed how much wildlife there really was… each brown and white dot in the photos below are penguins! 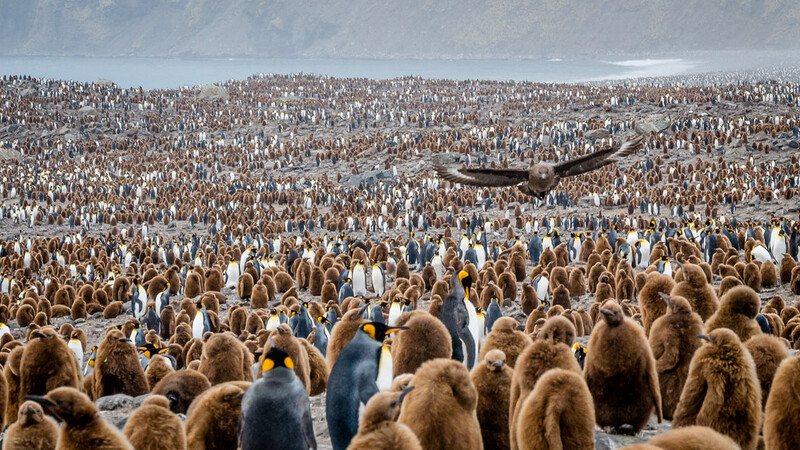 While I don’t have enough fingers and toes to count them all, I recall hearing estimates of 400,000 king penguin in Gold Harbour that day. 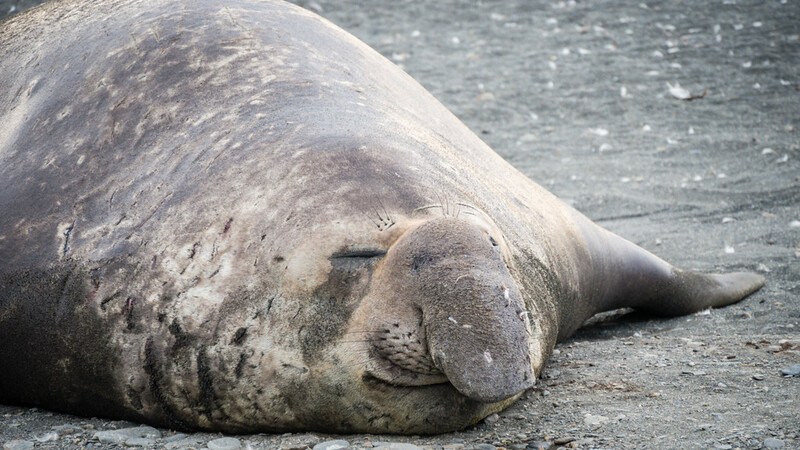 Mixed among the penguins were hundreds of elephant seals, each weighing up to 4000kg. 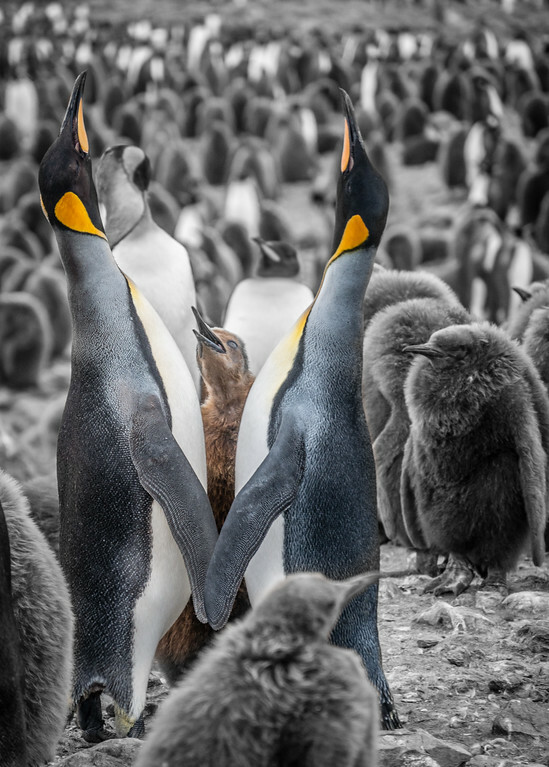 Do you now believe me when I say it’s the World’s Best Wildlife Destination? Sadly, our expedition in Royal Bay was spoiled by too much wildlife. Seriously. 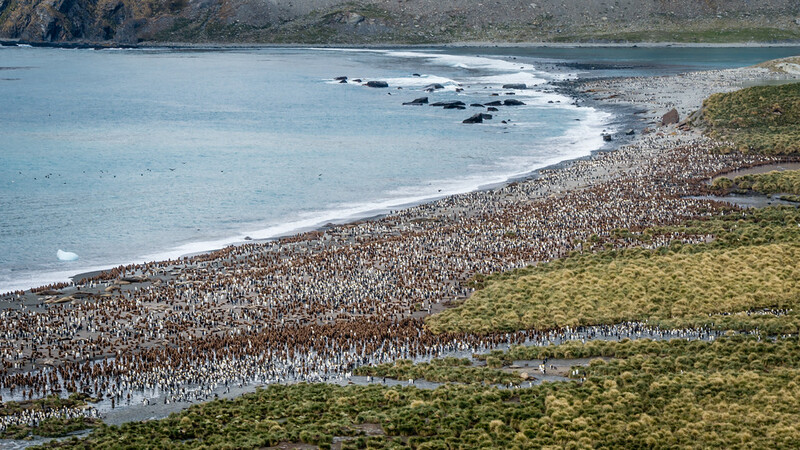 The entire beach was so FULL of penguins and seals, we were unable to do a shore excursion as there were no places to land the zodiacs. 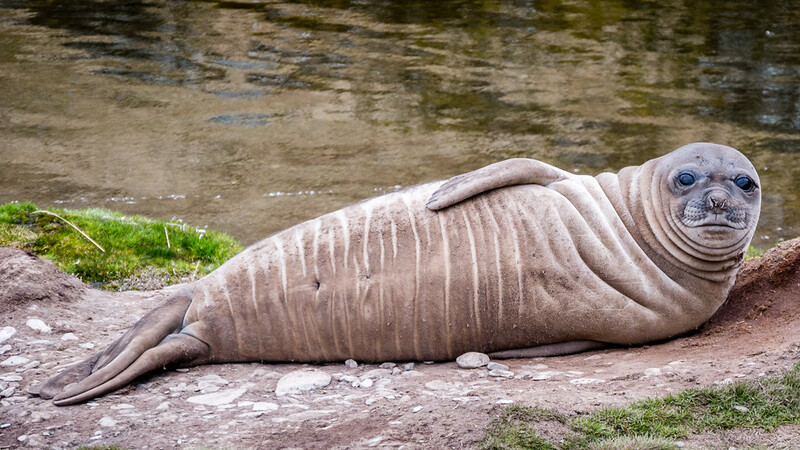 Instead, to ensure we wouldn’t disturb the wildlife, we went on a zodiac excursion instead. 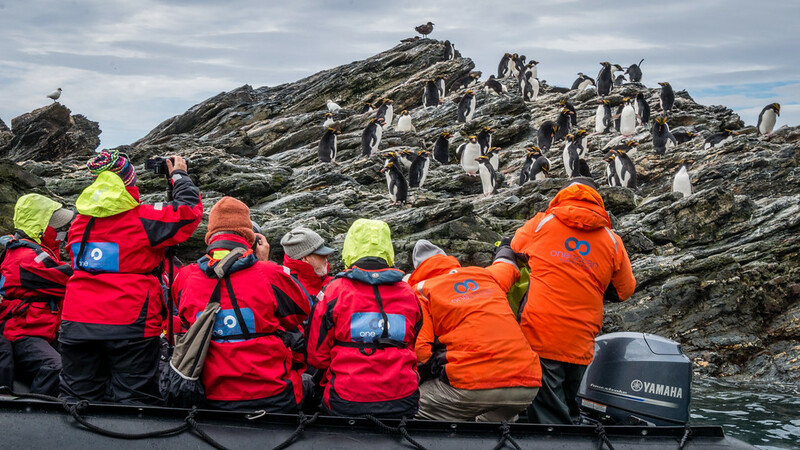 The zodiac excursion was still enjoyable as it gave us an opportunity to see macaroni penguins up close for the first time. 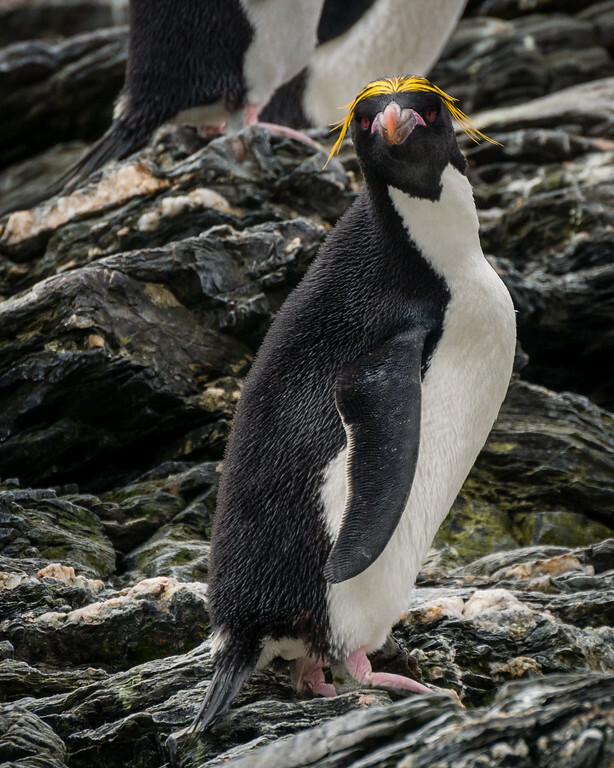 While macaronis are the most abundant penguin in South Georgia, and the world, they are often the hardest to visit since they nest on hard-to-reach scree and tussock slopes. 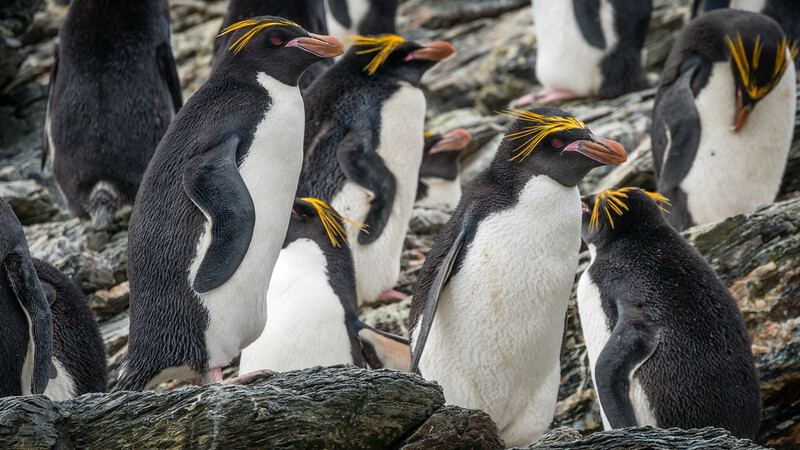 Macaroni penguins are a crowd pleaser given their bright yellow bushy “eyebrows”. The macaroni name has nothing to do with pasta but was rather the term used in 18th century England to describe men who dressed outlandishly. I dreaded our 04:45 wake-up call on Day 7, thinking nothing could even remotely come close to our morning at Gold Harbour the day before. It was one of those rare instances where I was happy I was wrong. St. Andrews Bay was breathtaking. 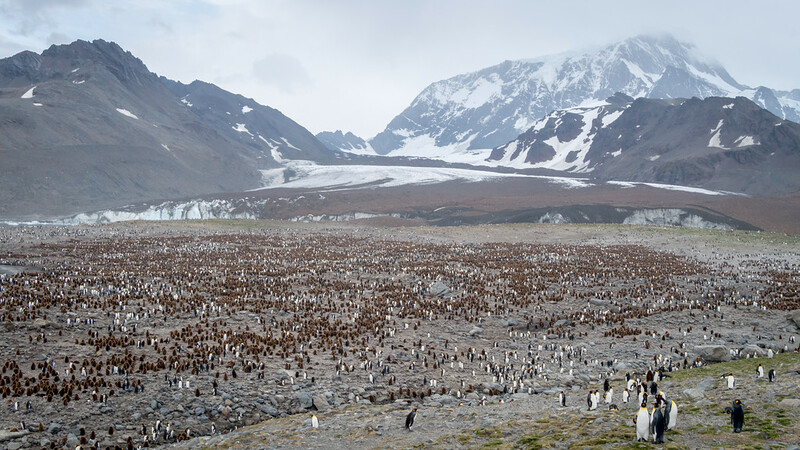 Like Gold Harbour, there were scenic glaciated mountain views complimented by hundreds of thousands of penguins. 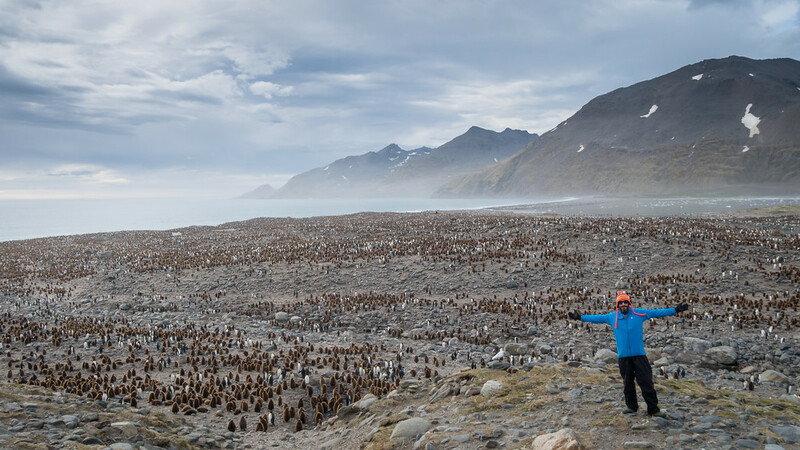 Unbelievably, I think there were more penguins in St. Andrews Bay than in Gold Harbour, with an estimated 500,000 penguins that morning. Our final expedition in South Georgia was another zodiac excursion in Cooper Bay. Given all we’d already seen, Cooper Bay was somewhat tame in comparison, but still beautiful in its own right. I especially liked the jagged mountain peak overlooking the bay. 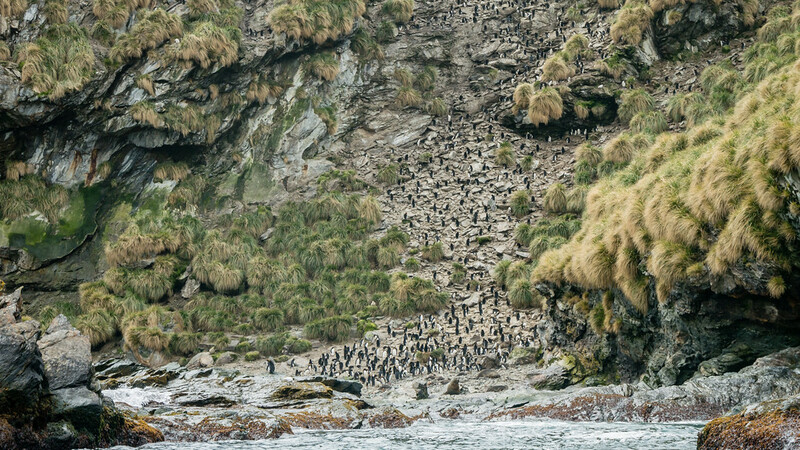 From a distance in the zodiac boats, we saw macaroni penguins nesting in the scree and tussock slopes, nesting shags, and numerous fur seals. 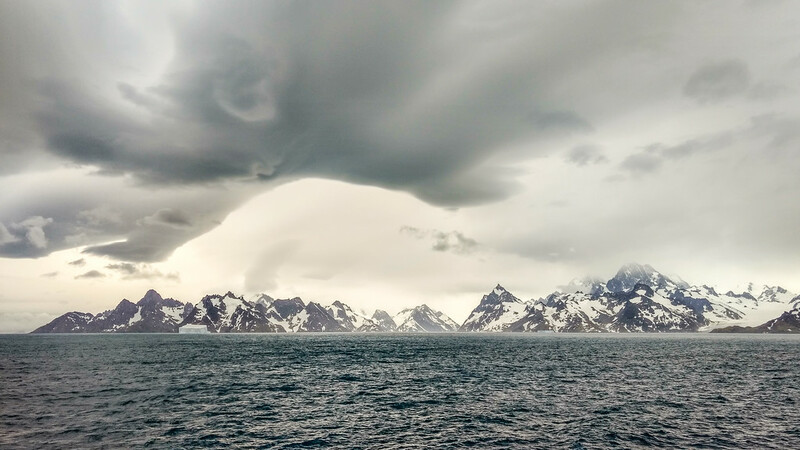 As we departed South Georgia towards Antarctica, we were treated with stunning landscape views across the southern part of the island. While we saw even more than I imagined during our 3 days in South Georgia, it was a very difficult place to leave behind.